In just a few short years, DAZN has gone from the stands to playing on the same field as pay tv operators when it comes to delivering first-tier sport events to viewers in Europe, Canada, and now the U.S. It launched in 2016 in Austria, Germany, Switzerland, and Japan, and not long after gained the rights to the NFL in Canada. In 2018, it announced a blockbuster $1 billion deal with Matchroom to deliver boxing matches in both the UK and U.S. via SVOD, a break from boxing’s traditional PPV model. DAZN Group CTO Florian Diederichsen will be one of our keynote speakers at Streaming Forum in London on 26 February, and we chatted with him via email about DAZN’s growth and its plans for the future. Streaming Media: DAZN has been called the “Netflix of sport” and has attempted to disrupt the world of sport viewing, which has traditionally been either part of a pay TV bundle or sold on a per-event basis. What made DAZN decide the market was ripe for the subscription model? Diederichsen: Sport is one of the last industries to benefit from the digital revolution, still being largely bundled with legacy satellite pay TV subscriptions in many countries. At the same time, the cost to watch sport has become far too high, pricing many out of the action. Yet, sport is uniquely positioned to be enhanced by digital—with multiple fixtures often happening at the same time, and far too many for traditional sport broadcasters to show. The result is producers decide what to show, which doesn’t serve fans. 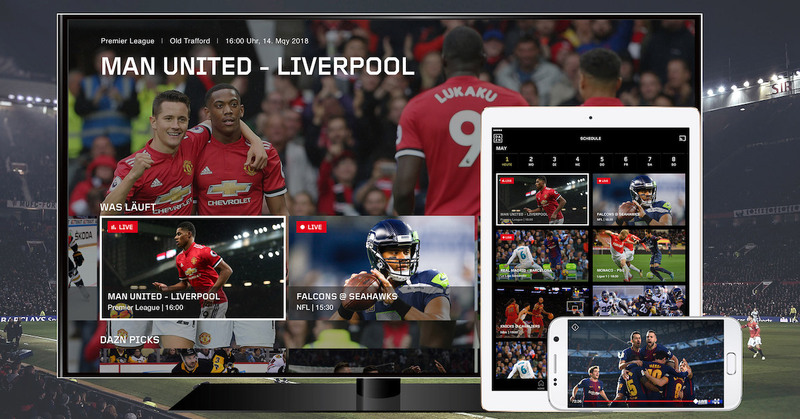 We saw the gap in the market before anyone else to launch a global pure sport streaming service, unlimited in the amount of live games it can show concurrently, available for an affordable price, payable my any means, no long-term contract, and watchable on almost any screen or device. We went live in Japan, Germany, Austria and Switzerland in 2016 and have seen rapid growth and great successes—now live in seven countries, including Italy, U.S., and Canada, with Spain and Brazil soon to launch. We got out of the blocks first, and now it’s about staying ahead. What has posed the biggest challenge to launching and growing DAZN — technical challenges, or rights challenges? Live and on-demand sport streaming is not easy, and we know we’re at the beginning of the unstoppable march to OTT which will ultimately replace traditional broadcast TV altogether. We see enormous audiences come in to watch live events, just minutes before they start—which is unprecedented when compared to scripted content, which audience binge sporadically over OTT. This means we need to have the technological capacity and stability to scale up and down rapidly, around the big sporting moments. We have fine-tuned every moment to get the best performance out of our tech stack and give fans the best possible viewing experience. But this is just the beginning of the shift to OTT, which ultimately will offer greater choice and a superior experience that is more intuitive and personalised. In terms of rights, we’ve enabled rights holders to do things differently, unlocking greater potential brought by digital distribution. We’re reaching new, younger and bigger audiences and increasing the value and popularity of sport for rights holders. For instance, our ten-year deal with the J League, Japan’s top football division and investment in the league driving both growing stadium attendances and TV audiences. The successes we’re having—with over 200 million hours of content being consumed by our customers in 2018—means rights holders are increasingly knocking on our door, which we welcome. Can you share any numbers or percentages regarding subscriber growth? If not, can you talk about what countries you’re seeing the most growth in, and why you think that is? Our subscriber numbers are really healthy—well into the millions—and we’ve met every KPI set since our service went live in 2016. We’re now the number one sport broadcaster in Japan, our first market, and after only launching in Italy in August 2018, are already the country’s number two broadcaster behind Sky. We’ve seen phenomenal growth, not just in terms of subscribers, but also with the markets we’ve expanded into in under three years with many more on the road map. Sport fans have migrated to the service because the proposition is clear and fair: affordable, just €9.99 in Europe to watch on any device including TVs, and no long-term contract, with the first month free. In the U.S. our service is slightly different, built with a fight sports offering at its heart. Again just $9.99, the service—which is home to boxing with Matchroom Boxing USA and Golden Boy Productions and MMA with Bellator and Comate Americas—is taking on PPV which charges up to $90 to watch a big fight. We think that’s wrong, and we know fans do to. It’s about providing a better, fairer way to watch. What do you think an OTT sport service can offer subscribers—and leagues—that pay TV can’t? Sport delivered by OTT offers unlimited benefits to fans and the sport industry. Number one is that streaming is unencumbered by limited TV channels and rigid broadcast schedules. This means OTT can show every event, every fixture, even non-live content like public workouts, training sessions, weigh-ins, and press conferences, which gives fans the power to choose what they want to watch. Beyond choice, digital delivery means we can create a personalised viewing experience based on stated and displayed behaviour. So, if you’re an Arsenal fan, we know that and can prioritise content to get you to the all action with the fewest clicks possible. Customers can already set mobile alerts for when games are about to start so they never miss a moment. We’re also bringing in new features like downloads, so fans can watch highlights offline. And a new multi-view feature means sport fans can watch up to four live events on one screen at the same time. Similarly, we broadcast our first game in 4K, covering the final of the J League for fans in Japan, which demonstrates just how advanced OTT has become. As technology advances, other things will become the norm, like voice and text chat on product between friends or fans, things traditional TV is simply not capable of supporting. OTT is a win-win for fans and the industry alike. How do you think the sport TV market (defined broadly to include pay TV, PPV, and OTT) will look in 5 years? We think we’re at a tipping point for OTT to enter the mainstream and ultimately dominate as the means for TV distribution, as 5G and superfast broadband proliferate and fuel video consumption around the world. Pay TV, which we are a part of, is a vital component of the sport business ecosystem, bringing essential funding into sport and fueling the passion of fans everywhere. This will continue but begin to change. As we have started to do in the U.S., our affordable monthly subscription model is tackling expensive PPV head-on and displacing it, with HBO bowing out of the boxing business after 45 years. Our vision is to do for sport what Spotify has done for music and Netflix has done for TV. This means a greater number of fans paying a more affordable price to watch exactly what they want to watch anywhere, on every screen. Register for Streaming Forum by 25 January to get an early-bird discount.